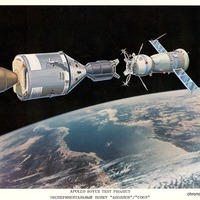 An artist's rendering of the docking of spacecraft in the Apollo-Soyuz Test Project (ASTP). The project was an experiment in cooperation and mating of different technologies from both the United States and the Union of Soviet Socialist Republics (USSR). The Apollo spacecraft was launched from Launch Complex 39B at John F. Kennedy Space Center in Merritt Island, Florida using a Saturn IB booster and docked to a Soyuz 19 spacecraft from July 15-17, 1975. Soyuz 19 was launched from Baikonur Cosmodrome, near present-day Tyuratam, Kazakhstan. The Soviet spacecraft was in orbit for five days. This successful mission led to cooperation on other projects including the International Space Station (ISS). "Apollo-Soyuz Test Project." National Aeronautics and Space Administration. http://www.nasa.gov/mission_pages/apollo-soyuz/index.html. 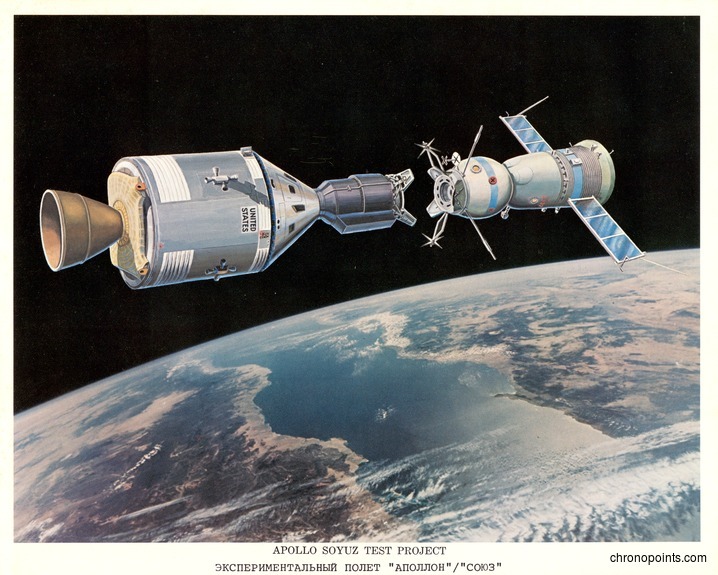 “Apollo-Soyuz Test Project.” RICHES of Central Florida accessed April 21, 2019, https://richesmi.cah.ucf.edu/omeka/items/show/6375.